Run for Your Life Past the Hazards of Heavy Traffic! "Why did the chicken cross the road?" That question has puzzled many an inquisitive mind for decades, if not centuries. Why would a bird known to taste like nearly everything under the sun brave a place where death can bowl over you any moment at a speed exceeding 65 miles per hour? We may never know, but perhaps Crossy Road can offer some insight into this age-old riddle. The object of the Crossy Road game is simple: travel as far as possible and survive for as long as you can. The simplicity ends there, for every step you take could be your last. There are cars to weave around, there's water to stay out of, and even the sky is home to its own share of dangers. Just like in real life, death will claim you eventually, but the journey is all that really matters in the end. 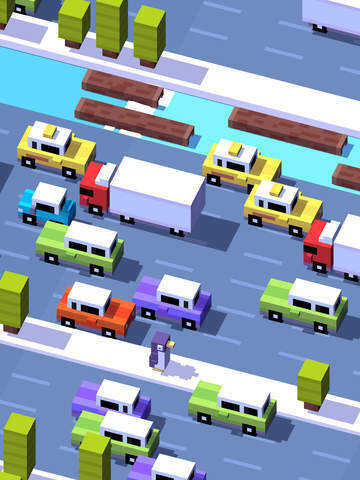 Crossy Road is a challenging game that's easy to learn, hard to master, and rewarding every step of the way. • Move quickly in any direction using intuitive and responsive touchscreen controls. • Features endless levels that change every time you play. No two games will ever be alike. • Earn coins as you play to purchase all sorts of goodies. • Saves your highest score so you'll know what record to beat. • Play with over 100 unique characters. The world of Crossy Road is a dangerous place, since nearly everything is trying to kill you! If you want to get anywhere in it, then you'll need quick wits and faster feet. • Carefully weave your way through traffic to avoid becoming road-kill. • Hop quickly across railroad tracks before the train runs you down. • Get across rivers safely by jumping on lily pads and floating logs. Don't linger for too long, or the current will take you away. • Stay on the move, or the Eagle will swoop in and get you! Are You Ready to Cross? If you're looking for a game to play for either short bursts of time or whole hours, then you can't go wrong with Crossy Road. It's easily one of the most addictive things ever digitally rendered on a computer screen. There's always one more road to cross, one more car to dodge, one more river to ford, and one more funny bloke to unlock. You can look both ways in Crossy Road, but you don't ever need to look back! Sometimes, a game comes along that forever changes the way we look at the medium. 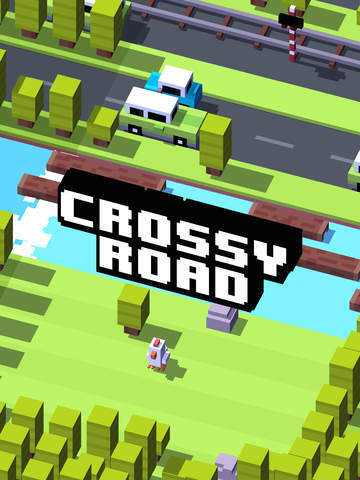 Crossy Road is not that kind of game, but it's still something that all mobile gamers should still get excited about. Drawing inspiration from the old arcade classic, Frogger, it sets the player out on a similar path: to reach the other side of the street without getting run over. However, this is no mere clone. 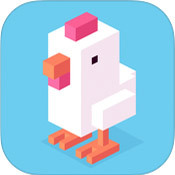 The folks over at the hilariously-named company of Hipster Whale took everything that worked before and put their own spin on it, adding a number of new features that give Crossy Road an identity of its own. The end result is one of the most finely-made and positively addictive apps your mobile device will ever see. The first thing to be said about Crossy Road is that the presentation is in top form. Everything is made with colorful blocky models. They may appear simple at a glance, but they ooze charm, not just in the way they look, but in how they act. The whole world looks like an elaborate Lego model, from the cars to the trees to the assorted characters you will be controlling. Everything moves with a great amount of believability, hitting just the right balance between cartoony exaggeration and fluid realism. Cars drive down the streets at varying velocities, a train shoots through the tracks at high speed after the railway light flashes red, your character moves forward with a playful bounce, things literally flatten when they gun run over, and water splashes via these hilarious blue cubes. It helps that the sound is integrated almost flawlessly into the app. Nearly everything has a proper effect to go with it. Cars honk, trains roar on the tracks, and you'll hear a very satisfying "splat" when you meet your untimely end. Even the many characters you play as have distinctive voices. Chickens cluck, dogs bark and whine, horses whinny and neigh, and so on. That's before you start getting into the more exotic avatars. It all helps to make the world feel alive, give it a personality, and add to its often surreal sense of humor. The many deaths you'll suffer through in Crossy Road will never feel frustrating because it's so funny seeing your poor little critter flatten into a pancake whenever it jumps into a moving vehicle. Perhaps the most impressive thing about the Crossy Road app is just how varied it can make things look despite its graphical simplicity. The sheer number of characters you have the option to play as is proof of this. You start out with a humble chicken, but can also earn a variety of other fauna. Some of them are relatively mundane, being other animals like ducks, dogs, badgers, foxes and so on. However, there are other more interesting critters too, such as a fish the flops helplessly on the ground, a fire-breathing dragon and an emo goose. There are even some humanoid figures like a wizard, a schoolgirl and Frankenstein's monster. All of them look distinguishable with Crossy Road's aesthetics, and nearly all of them have a unique voice. It would be enough if your chosen character simply altered who you played as, but it can go much farther than that. Many characters will also have an effect on the general look and feel of the game's world as well. For instance, everything will look like an old horror film if you play as Frankenstein's monster, complete with a black and white color palette and ominous thunderclap. Meanwhile, the Emo Goose will cause everything to be drenched in gloomy rainfall. This is mostly an aesthetic effect, though there are a few rare cases where it will alter the gameplay a bit as well. For example, if you play as an Australian animal like the kangaroo, the game will complete the Outback appearance it adopts by putting in more hazards, including crocodiles in the rivers and drop bears in the trees. The game plays just as well as it looks. Controls are simple and responsive; tapping the screen will move you forward, and swiping it will move you in the corresponding direction. Your success is going to be measured by simply how well you can avoid the obstacles, of which there are many, like cars, trucks and trains. There are also rivers that can only be crossed via still lily pads and moving logs, as well as things like trees and rocks that get in your way and restrict where you can go. You can never get complacent either because waiting too long will result in an eagle snatching you up for breakfast. It may not sound like much, but it's all Crossy Road needs to be a challenge. It never lets up either for two reasons. The first is that every time you start up a game, the level is procedurally generated. Everything about it, from the width of the roads and rivers, the number of railroads, and the arrangement of obstacles, will be randomized each time. The other is that the level never ends. It keeps on going and grows progressively more difficult the further on you travel. The end result is that Crossy Road never feels stale or repetitive. Each new game you play feels completely fresh. You may curse when some stray vehicle ends your run, but you should be ready for another round immediately after just to see how far you can get in this brave new world that's just been generated. If you're not careful, you can easily lose an entire hour or two just hopping across the street. If there is one weakness to the game, it's that swiping feels a tad too slow to be dependable. While the controls are responsive, the fact remains that swiping is still a more complex action than tapping the screen. This can make elaborate movements through heavy traffic very difficult. It doesn't affect the game negatively too much, but it's still something to keep in mind. What really earns Crossy Road a lot of points is just how unobtrusive it is. It's a free-to-play game, but it never gives you the hard sell. There's no energy meter to restrict how long you can play, there's no pay-wall blocking gameplay from you, and while there are ads, you only view them when and if you want to. Nothing will ever interrupt your gameplay. The only thing the game has to sell are additional characters, which are mostly visual and can be obtained by playing normally anyway. Seldom have we seen a freemium app that welcomes you to just sit back and enjoy it on your own terms, but that's exactly what Hipster Whale has provided. For that reason and everything else it has going for it, Crossy Road is well deserving of a place in your library. Get it now!